My daughter Katie just turned 6, and she is completely enamored with all things relating to Harry Potter, so of course that needed to be the theme for her birthday party. 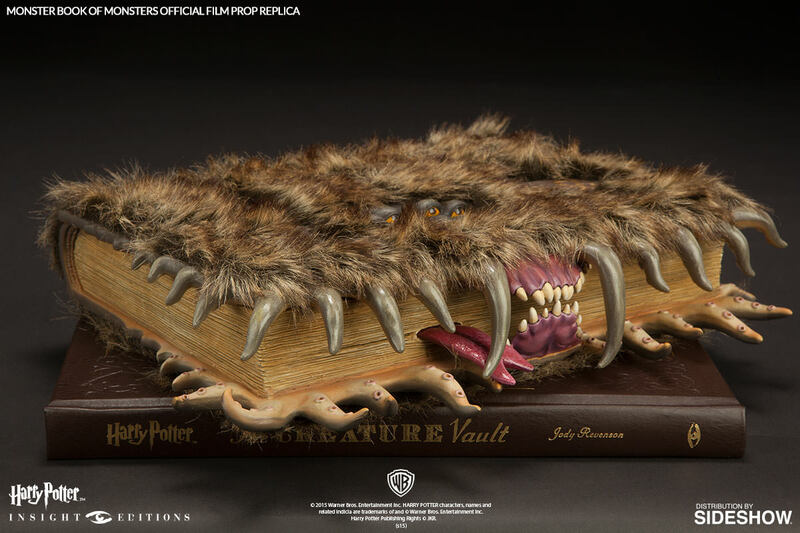 When we looked at examples of Harry Potter cakes, the Monster Book of Monsters was her immediate first pick. 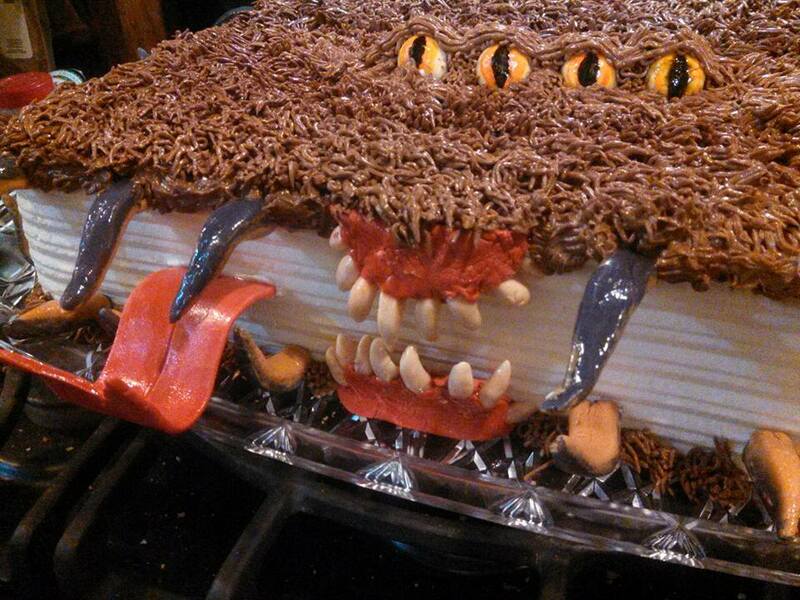 I decided to model the cake after a movie prop replica that I found on the Internet. 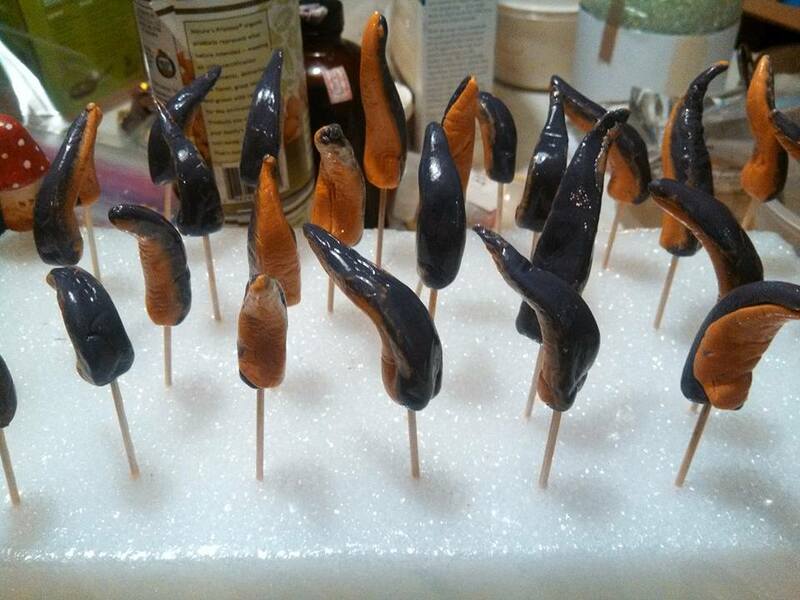 I used gumpaste for the tentacles, eyes, gums, teeth, and tongue, so that it would dry hard and hold a perfect 3-dimensional shape even in the face of the heat and humidity of an August birthday party. Thankfully I had some gumpaste left over from some recent projects, so it was easy to mix up the colors I needed to create the pieces, and I painted on the irises and monstrous pupils with food coloring gel mixed with a bit of vodka. 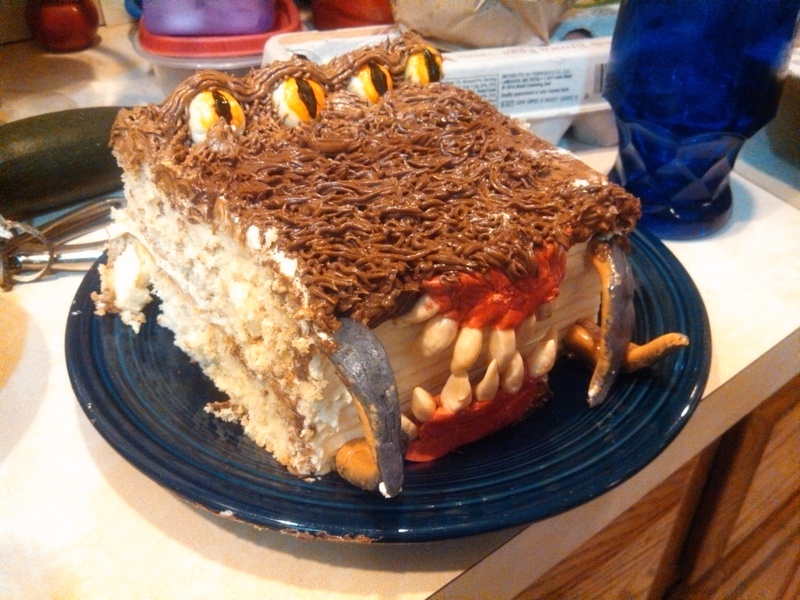 I formed the tentacles and gums onto toothpicks, so that they could be inserted into the cake at the proper angles, and a mix of 2 parts vodka and 1 part corn syrup gave the perfect creepy shine to all of the parts. 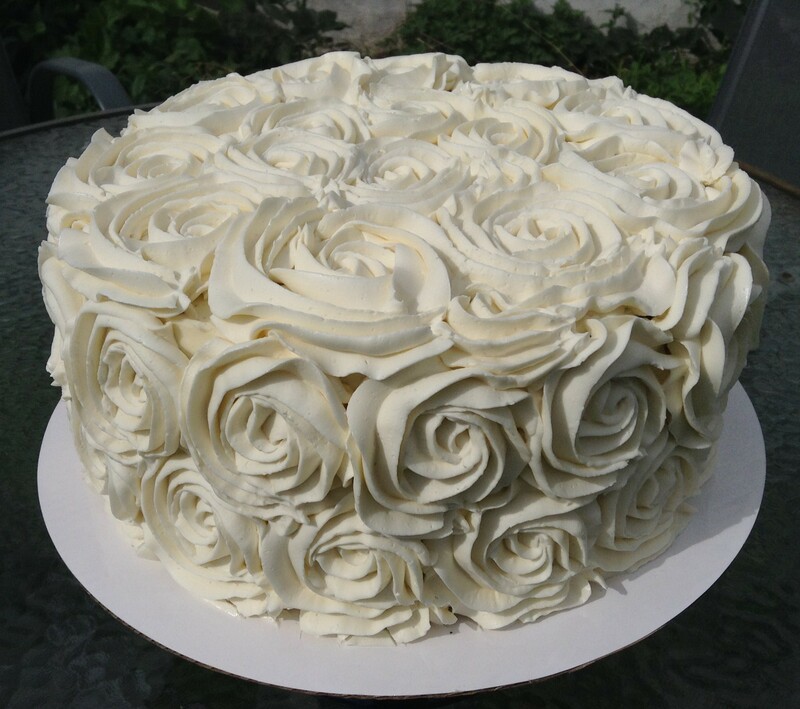 I baked a 2-layer 15×11″ cake (vanilla, per the birthday girl’s request) and iced it with Italian meringue buttercream. 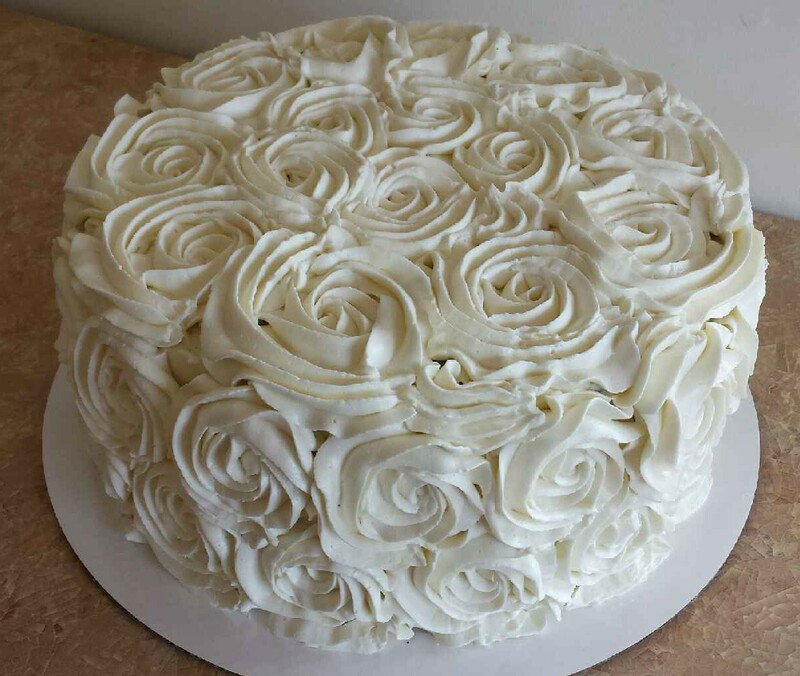 The cake was filled and three sides of it were iced with vanilla buttercream, and a Wilton decorating triangle made the perfect impression of pages. A Wilton #233 fur tip did a great job of creating the furry cover. Of course I’m a little embarrassed to admit that out of the whole cake, the part that impressed my daughter the most was the appearance of pages. I do have to agree that I could have asked for that to be better. 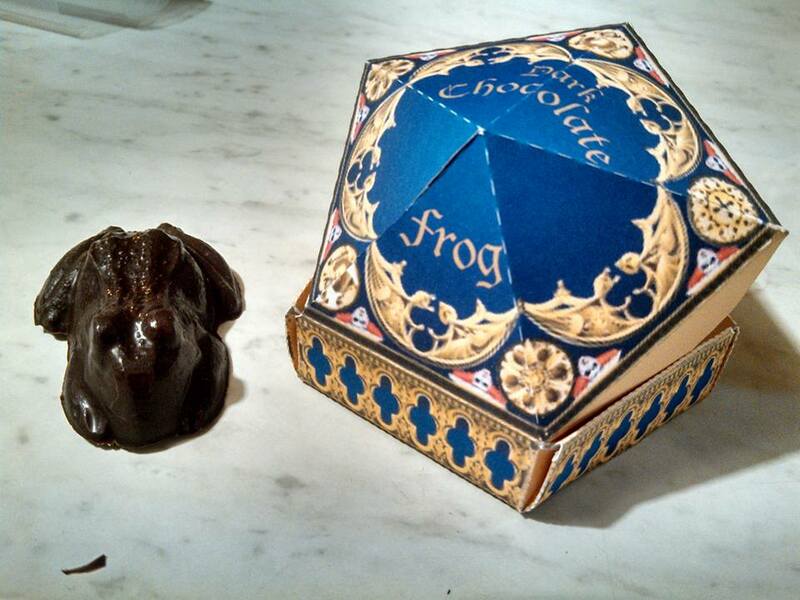 No kiddie birthday party would be complete without favors, so Chocolate Frogs in pentagonal boxes were the order of the day. Of course each box contained a Wizard Card, and some lucky guests were fortunate enough to get a card of the birthday girl herself. Bertie Bott’s Every Flavour Beans and chocolate-covered pretzel wands were also quite popular among the guests. 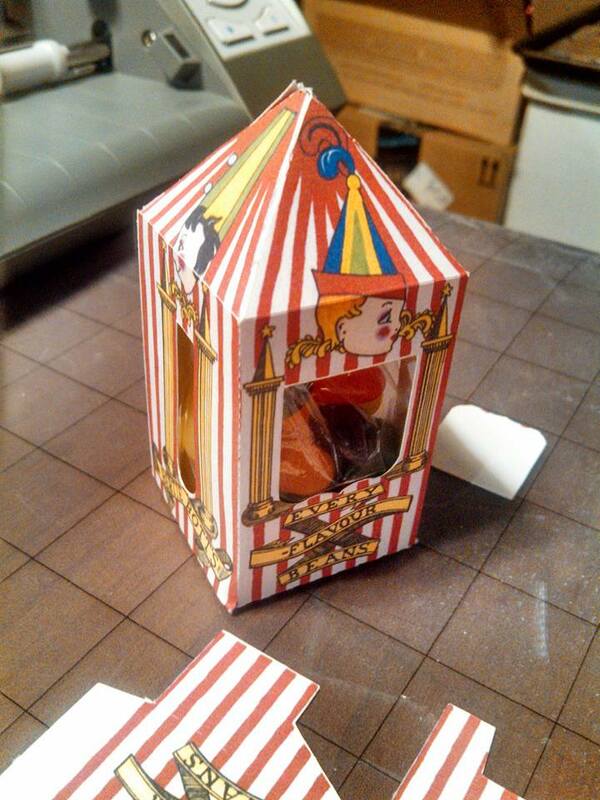 I was very, very busy with my copy of the GIMP, my inkjet printer, and my Silhouette Cameo cutting machine. It turns out that the cake isn’t any less creepy when it’s mostly eaten…but it made a certain little girl extremely happy. 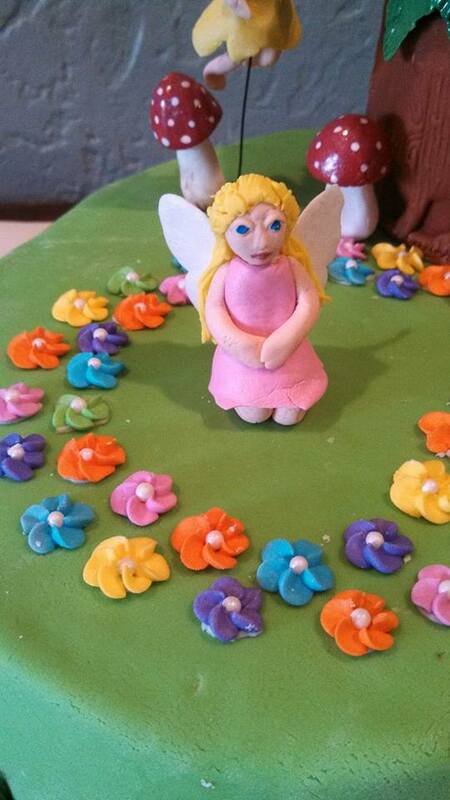 I recently had an opportunity to make a pair of whimsical fairy cakes for a friend’s baby blessing. 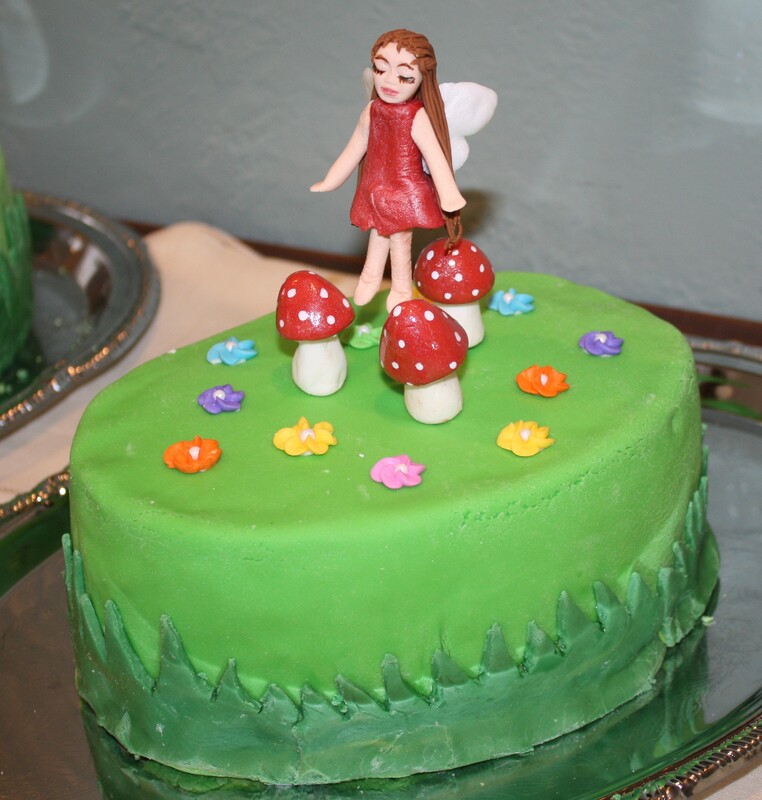 The entire cake, including the Italian Meringue Buttercream, royal icing flowers, and gumpaste fairies and toadstools were vegetarian and egg-free, and was a real showcase of the things that can be made with aqua faba — the liquid drained from a can of beans! There were two cakes in order to accommodate dietary restrictions, but they made a lovely pair. Every component of these cakes contains aqua faba, and over two quarts of it were used in the making of these cakes. 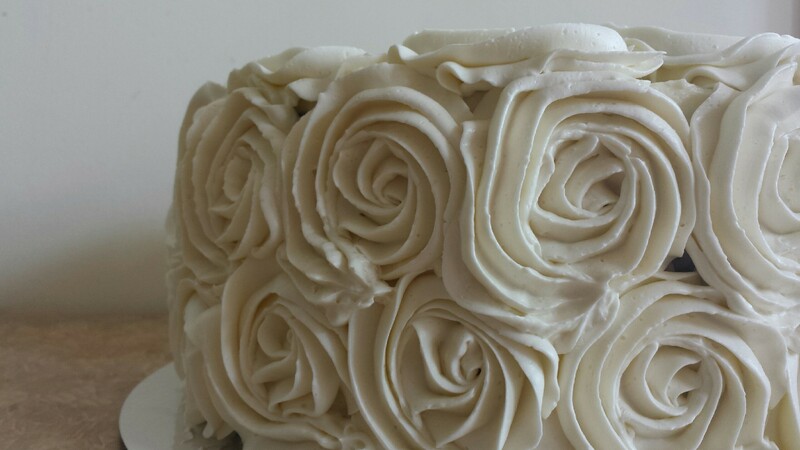 The cakes were served at a tea party, so I added sugar cubes adorned with matching royal icing flowers. Since the recipients were vegetarian, and requested sugar that had not been processed wit bone char, I first molded my own sugar cubes. 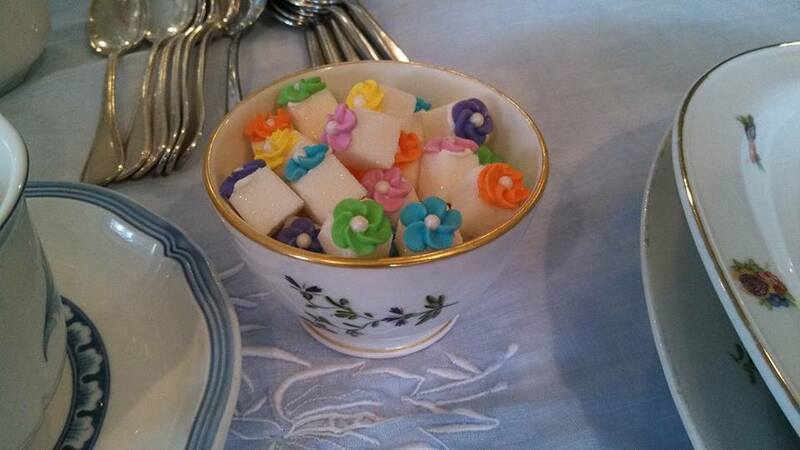 I don’t know why, but nothing charms a crowd like tiny floral sugar cubes. 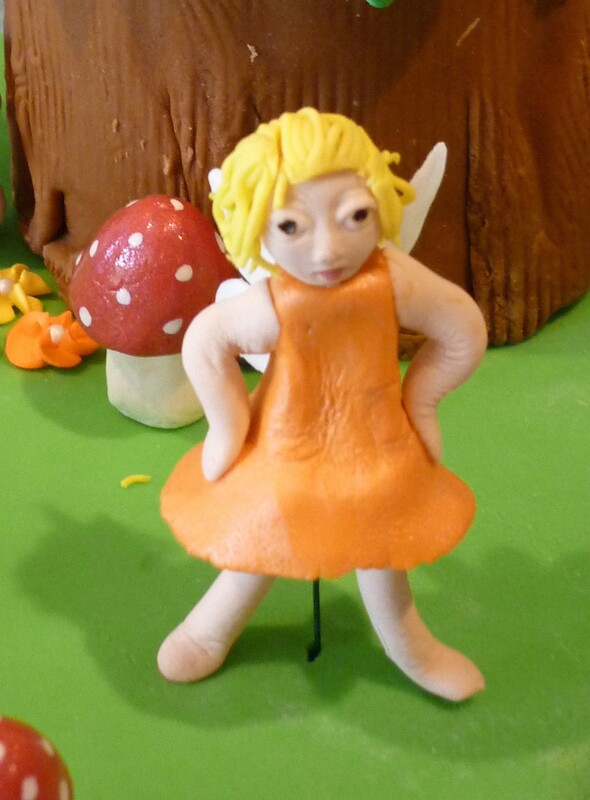 I molded the fairies by hand from vegan gumpaste, using a face mold to get detailed facial features. 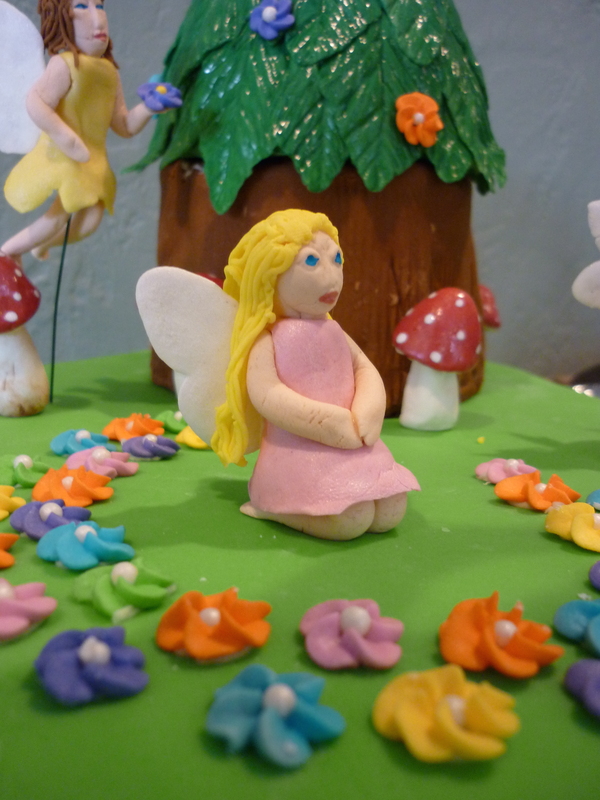 I cut the fairy wings using small butterfly fondant cutters, and used fondant cutters to thin them out and make them ripply. Then I used a clay extruder to make the hair. The wings and dresses are painted with pearl dust mixed with vodka, to add a subtle sparkle. 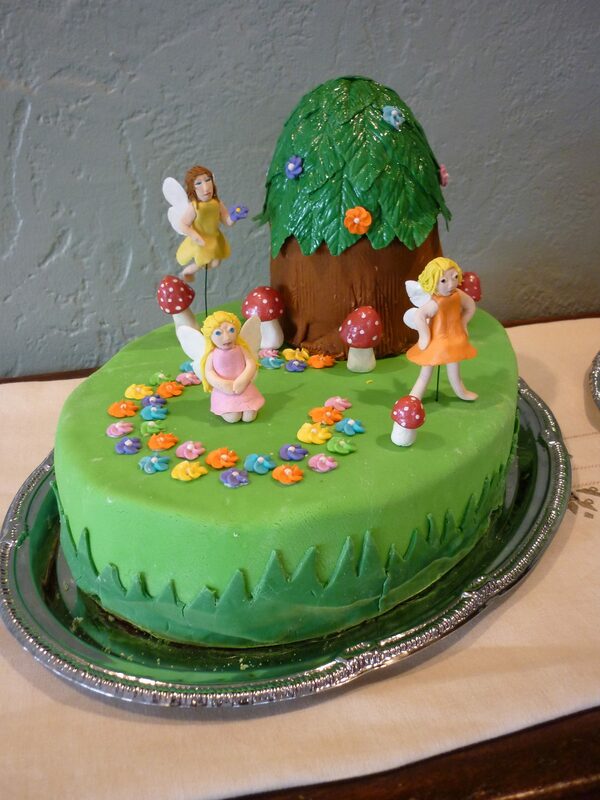 The red fairy is suspended above the cake on a wire. 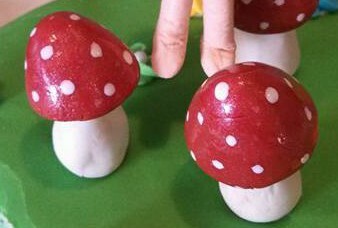 I also used gumpaste for the toadstools, and painted an edible shine on the caps with a mixture of 2 parts vodka and 1 part corn syrup, with a silver luster dust mixed in. 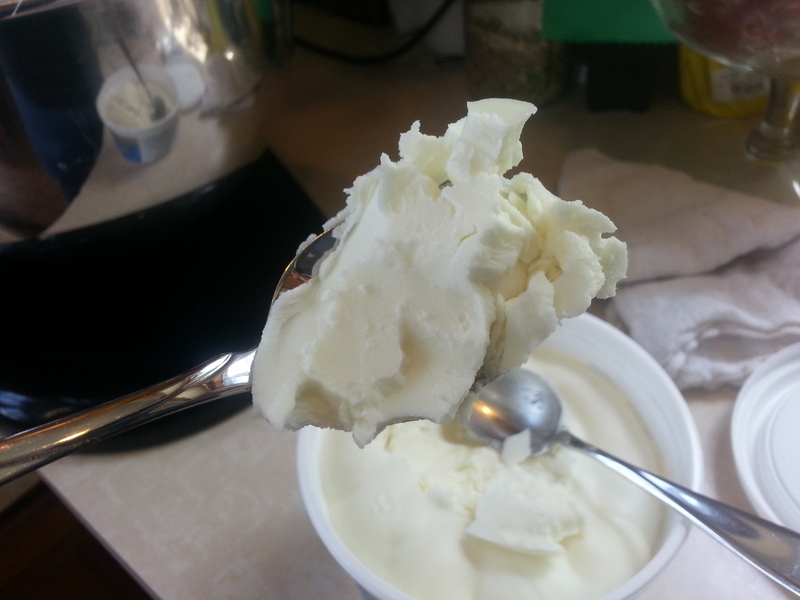 The white spots were made with white food coloring added to a bit of edible shine. A pathway of royal icing flowers led away from the fairy house and more flowers adorned the roof of gumpaste leaves. 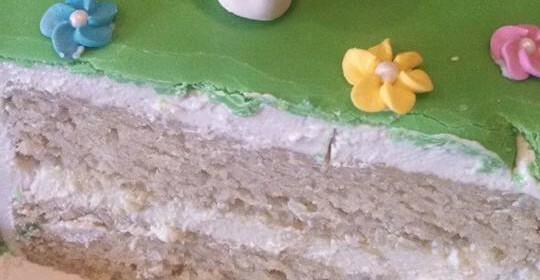 The cake itself was a vanilla sponge cake, filled with lemon curd Italian Meringue Buttercream, iced with vanilla Italian Meringue Buttercream, and covered with vegan aqua faba marshmallow fondant. Lemon curd mixed with Italian Meringue buttercream may be my new all-time favorite cake filling. Mixing the lemon curd with the IMBC “takes the edge off” the tartness and results in lemony, creamy awesomeness. Yum! 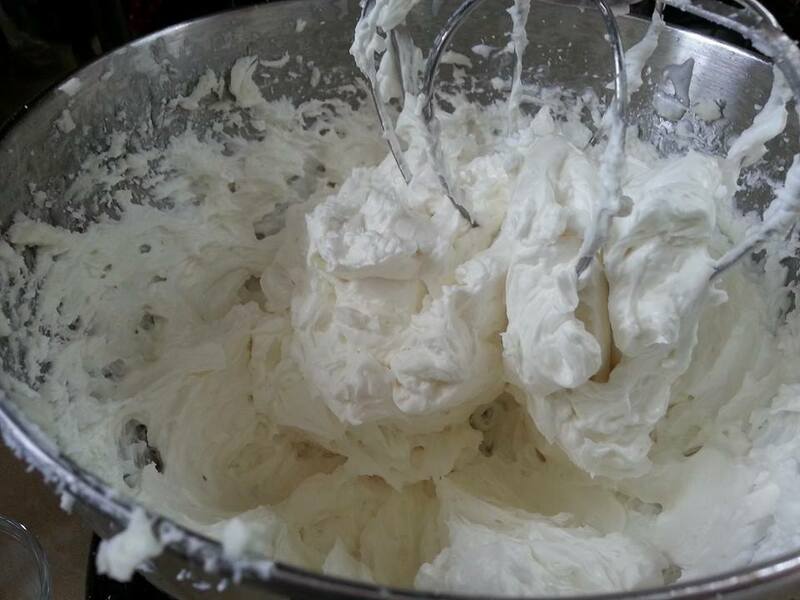 In truth, the aqua faba marshmallow fondant was a bust — it wasn’t stretchy enough, it had a tendency to crack, and it was extremely difficult to work with. That recipe needs to go back to the drawing board, but the rest of the cake was a resounding success. I’ve been wanting to try out the rose swirl technique, and a friend’s upcoming birthday was a perfect excuse. Not bad for a first try. This technique is incredibly simple, and creates a stunning result. 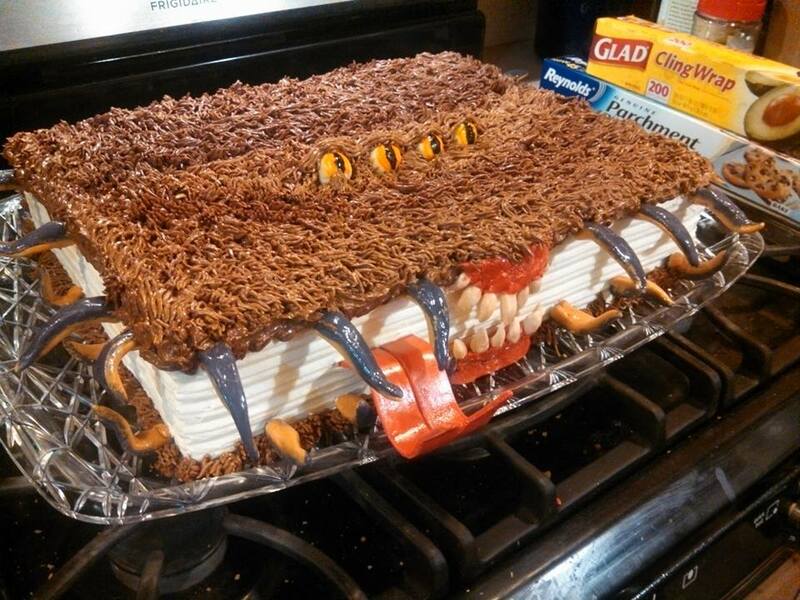 It does use a lot of frosting, though! The cake is King Arthur’s Gluten Free Chocolate Cake, and it’s covered in vanilla Italian Meringue Buttercream. 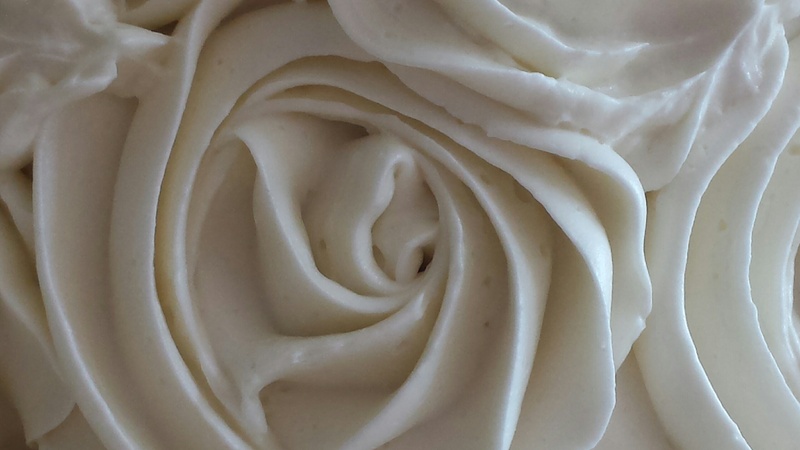 Having made a huge batch of Vegan Italian Meringue Buttercream in the process of writing up my recent blog post, I needed to put some of it to good use. Clearly cupcakes were in order. Chocolate cake with vanilla icing is a classic combination, and difficult to resist. I turned to Rebecca August’s excellent Chocolate Midnight Cake recipe as posted in the Vegan Meringues — Hits and Misses Facebook group. Some of these beauties went off to a bake sale, but the rest stayed home to share with friends. 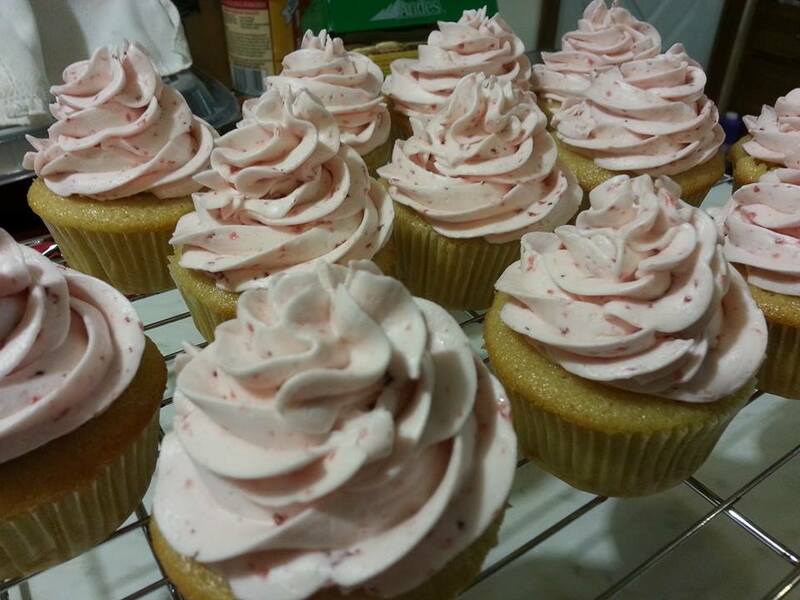 They were so popular and so delicious that I may just need to make another batch. When making these, have your pans ready to fill as soon as the batter is mixed, and be prepared to bake them all at once. 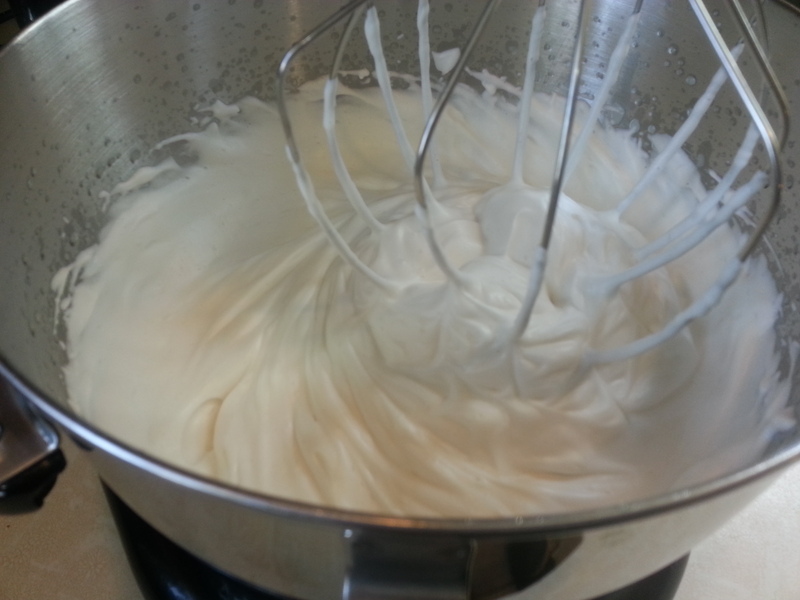 Your cupcakes will be best if they go into the oven as soon as possible after mixing. Line 24 muffin cups with paper liners and set them aside. If you won’t be able to bake all 24 cupcakes at once, divide the recipe. 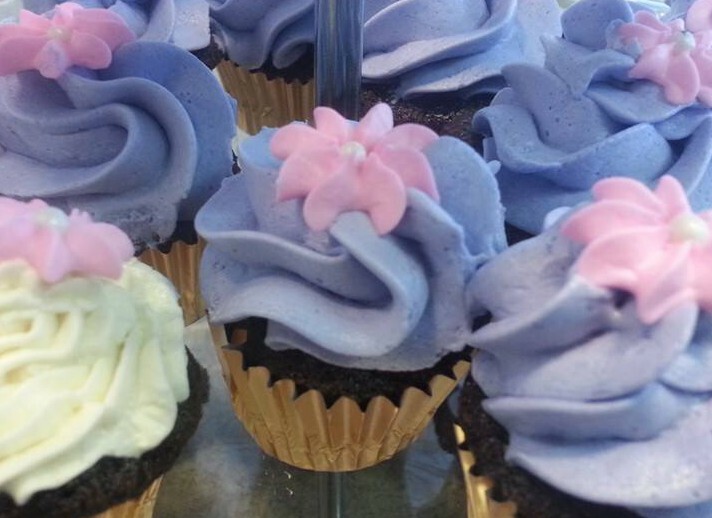 These cupcakes will have the best texture when the batter goes into the oven immediately after mixing. Sift flour, sugar, salt, cocoa, salt and baking soda into a medium-sized bowl. 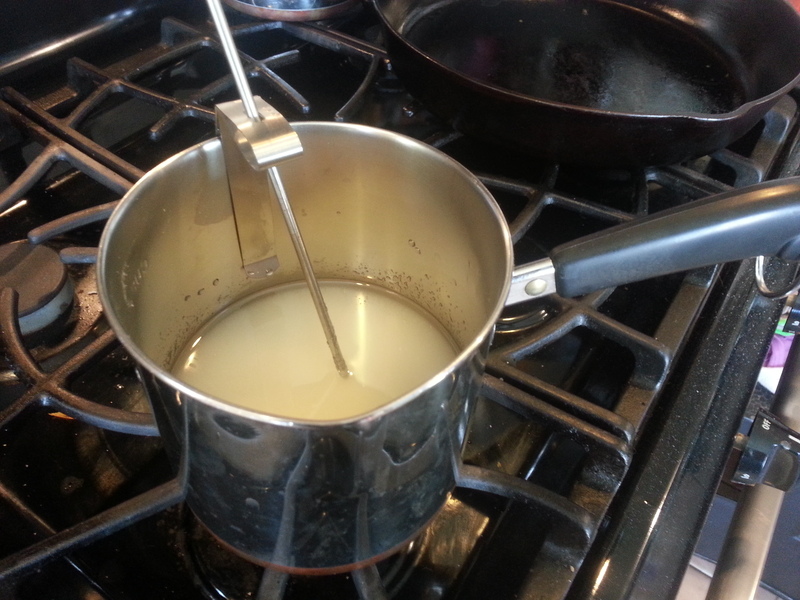 Add oil, milk, and aqua faba, and stir with a spoon until smooth. 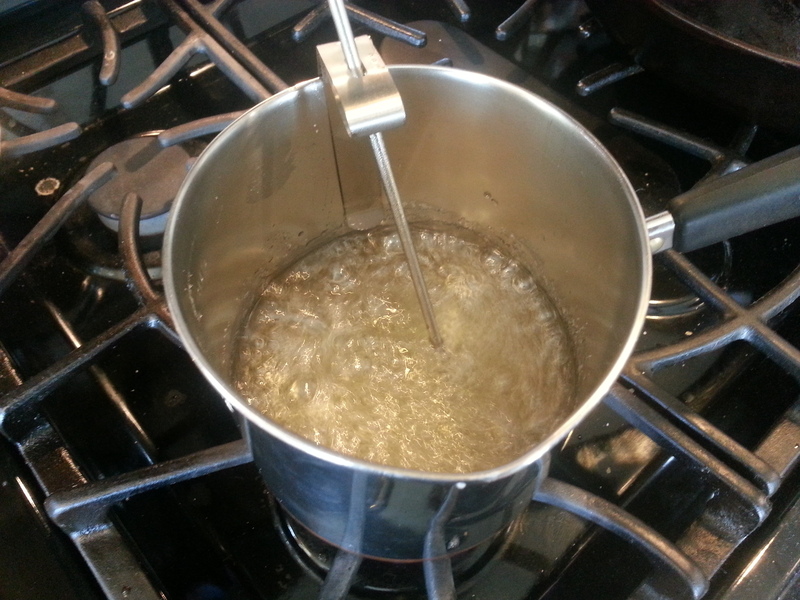 Stir in hot coffee until smooth. The batter will be very thin. Divide batter evenly into 24 muffin cups. 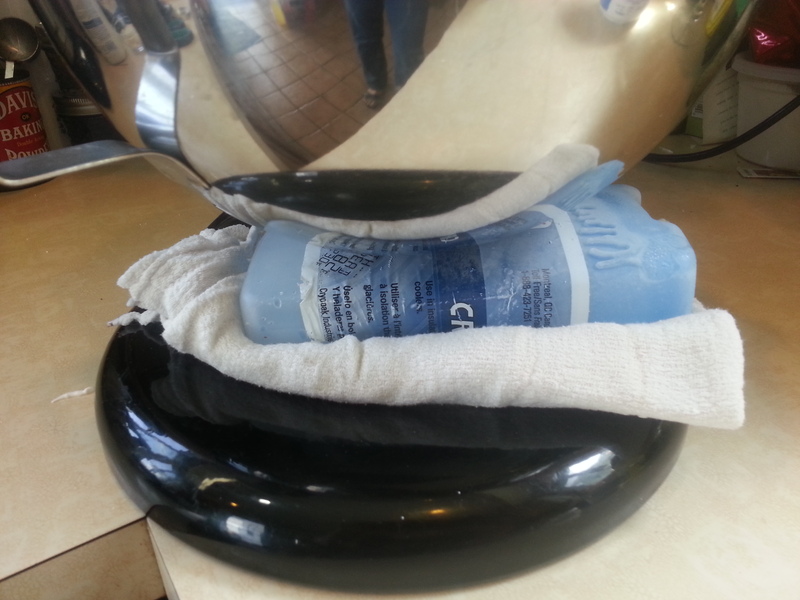 Bake at 350ºF for 18-20 minutes. Check early and don’t overbake. Cupcakes are done when a toothpick inserted in the center comes out clean and they spring back when pressed lightly in the center. 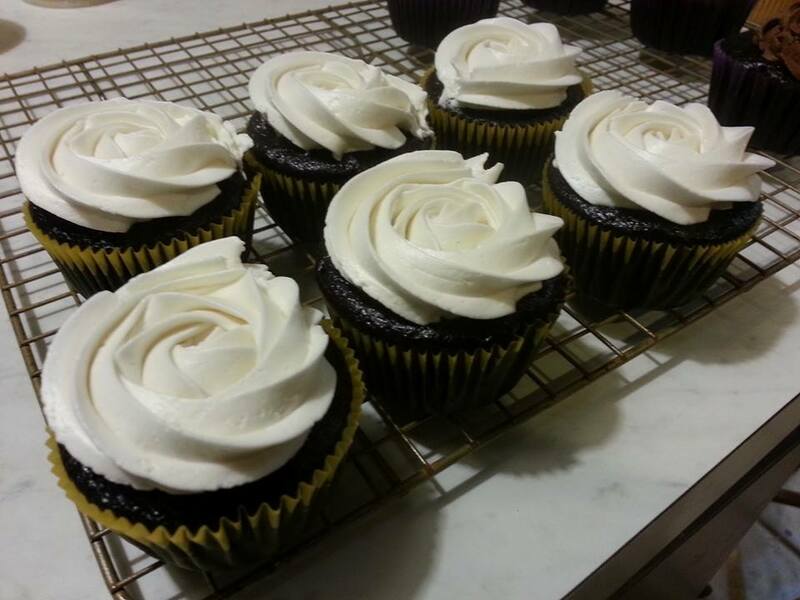 When the cupcakes are cool, frost with vanilla Italian Meringue Buttercream, (the recipe as written will make far more than you’ll need — halve it, and/or freeze the rest of the icing in an airtight container for another day). This post is just a tease, really, because it doesn’t contain any recipes or anything. It’s the result of trying out a new-to-me recipe (the highly-acclaimed Golden Vanilla Cupcakes recipe from the book Vegan Cupcakes Take Over the World), trying to use up some leftover Italian Meringue Buttercream and strawberry puree (you have that stuff laying around your kitchen, too, don’t you? or is it just me? ), trying out the technique of incorporating fruit puree into IMBC, and testing just how well aqua-faba-iced cupcakes freeze and thaw. 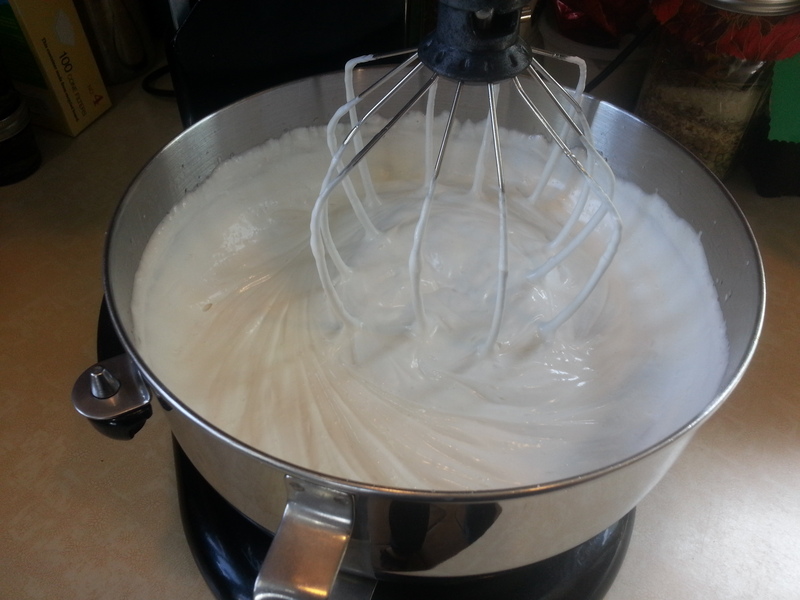 I promise that a recipe for the Italian Meringue Buttercream will be forthcoming! 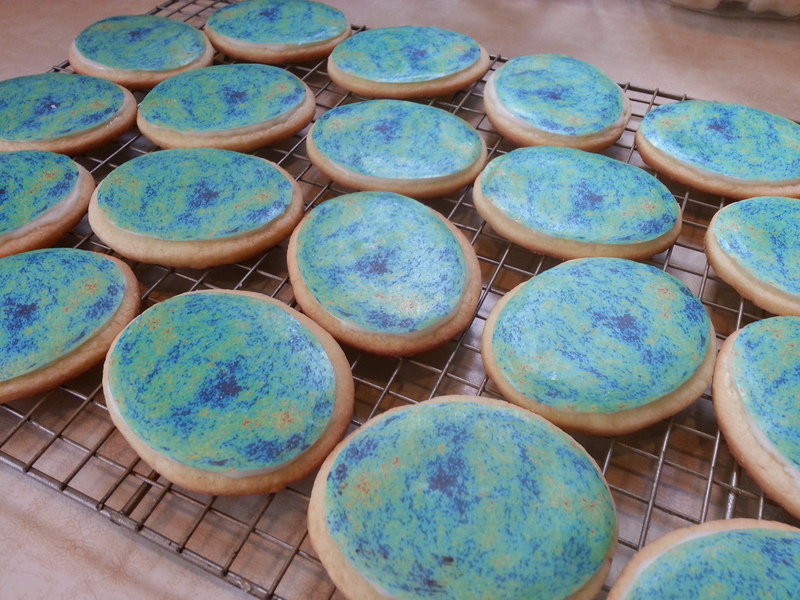 I had intended to make these Cosmic Microwave Background cookies for the Science Festival Chorus post-performance party, but I had too much going on with the Rainbow Prism Cake, so they didn’t get finished in time. Since I had all of the parts (not to mention an eager 5-year-old in the house), I made them anyway. 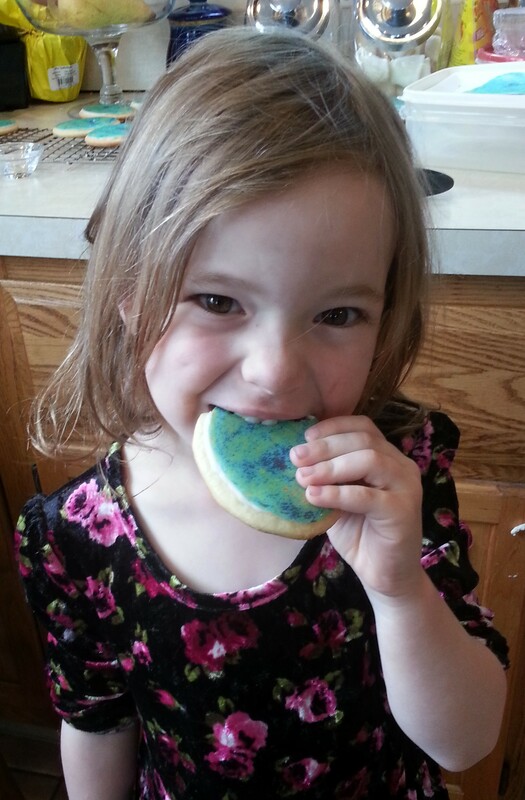 Basic sugar cookies, icing, an edible ink printer, and some wafer paper, and all of your geeky dreams can come true.